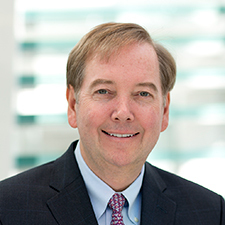 James G. McMillan is Pew’s general counsel and corporate secretary. He oversees a variety of general corporate legal and risk- management matters, and supervises relationships with outside counsel. He provides legal advice to Pew's board of directors, as well as to senior management and staff, regarding the institution's activities, including its programmatic and corporate operations. Jim also serves on the board of directors of the Pew Research Center, a subsidiary of The Pew Charitable Trusts. Jim has almost 30 years of experience as an attorney. Before joining Pew, he was a partner at Hogan Lovells US LLP, an international law firm, where he managed a high- level corporate practice representing Fortune 500 companies and leading nonprofit organizations. He worked with boards of directors, senior executives, and in-house counsel on significant transactional, corporate governance and legislative matters. Before becoming a partner at Hogan Lovells in 1995, he served as an associate at the firm and at the international law firm of Skadden, Arps, Slate, Meagher and Flom LLP. Jim also has broad legislative and policy experience, having served from 1990 to 1993 as counsel to Senate Minority Leader Robert Dole. He advised Sen. Dole and other members of the Senate Republican leadership on legislative matters, including securities, banking, commercial and labor issues. Jim earned his bachelor's degree from the University of Virginia, where he was enrolled in the Honors Government Program, and his doctorate in law from Harvard University. He is a member of the bar in the District of Columbia and Maryland.